It’s time for a give-a-way! I have a Belkin Devices Professional Pop-Up Shade for Canon 5D Mark II that I’m giving away here at the blog–still in the original packaging, valued around $30. The photo is of the actual shade on my 5D Mark II; the shade was only used twice, once for a brief test after purchase and the second time while taking this photo. The shade slides onto the eye piece slot of the viewfinder and includes overlay buttons for all the buttons to the right of LCD screen. 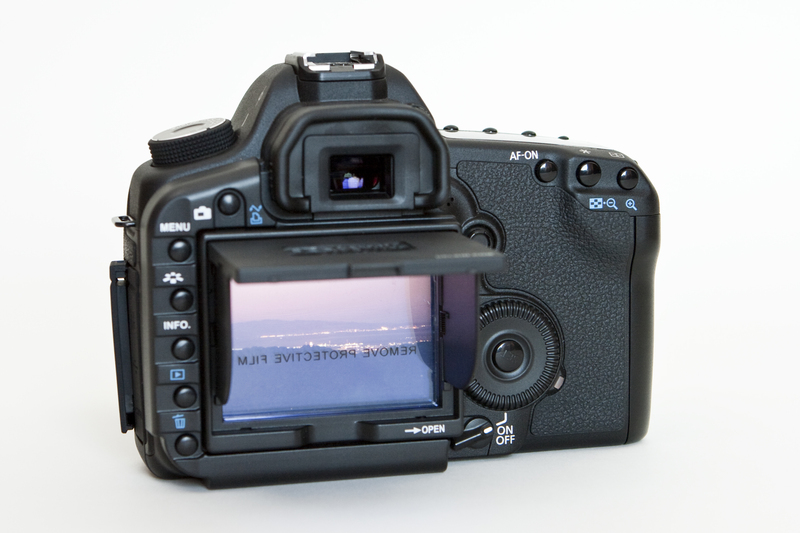 The shade helps protect the LCD on the 5D Mark II and pops-up to provide shade when viewing images on the camera. The protective film is still on the inside of the shade’s screen (evident by the printing on the screen when you click on the image to see if full size…). No, this is not a vendor sponsored give-a-away (if it was I’d say so). Simply put, I bought this pop-up shade shortly after I bought my 5D Mark II. Unfortunately, the shade won’t fit on the camera when my tripod L-bracket is installed (fellow L-bracket owners take note!). When I had the time to return the shade, I had missed the return window. My bad timing = you’re good luck! leave a comment on this blog post before Midnight Friday October 16th. Comments require your email address (which I do not disclose to any outside parties) which I will use to alert the winner. After alerting the winner, I will do a post announcing the winner here on the blog. So leave a URL with your comment for inclusion in the announcement post. And rather than just leaving a blank comment, provide a link to your favorite photo or video that you have taken with your 5D Mark II. Not required to participate…just trying to make it more interesting for all! Each comment is assigned a number. On Saturday October 17th I will have a random number generated using Random.org between 1 and the total number of comments. The winner will be the comment associated with the random number generated. The winning commenter will be alerted by email and I will mail the shade to them. Please help spread the word by (re) tweeting this post! It would be interesting to see how much it helps in contrasty lighting situations.